One of my favorite things to do during the Christmas season is to host a “decorate your own gingerbread party.” Then, there is the Christmas season which I view as an excuse to bake a batch of all of my favorite cookie recipes. Of course, I have to splurge and have all of my other favorite Christmas sweets and treats around the the house….Isn’t it obvious that I just had to make a Christmas Cookies and Treats Bingo game? It’s also a great game to play at a Christmas Cookie Exchange Party! 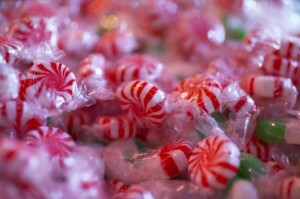 Peppermint Candy would make a great marker with the Sweets and Treats Christmas bingo game!